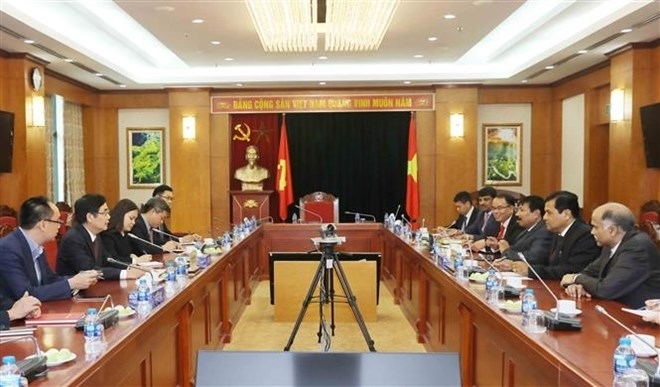 Head of the Communist Party of Vietnam (CPV) Central Committee’s Commission for External Relations Hoang Binh Quan welcomed the Vietnam visit by Governor of Assam State of India Sarbananda Sonowal to seek business opportunities with Vietnamese localities during their talks in Hanoi on May 14. Sonowal, who is also high-ranking leader of the Indian People’s Party (BJP), is in Vietnam from May 13-16 at the invitation of the External Relations Commission. Quan said the Governor’s first visit within the framework of the Distinguished Guest Program between the commission and the Indian Foreign Ministry is to specify agreement between the two countries’ leaders, contributing to strengthening friendship and comprehensive strategic partnership between Vietnam and India, and between Vietnamese localities and Assam state. He highly valued friendship and cooperation between CPV and BJP, expressing his belief that the visit will further expand bilateral coordination in the near future. The guest, for his part, lauded Vietnam’s economic achievements over the past years. He said Assam is the largest state in the northeast and a gateway connecting India and Southeast Asia. According to him, Indian Prime Minister Narendra Modi issued a policy of expanding connectivity in the northeast in line with the Act East Policy of India. He said the state is strong in agro-forestry-fisheries, mining, tourism, services, adding that experiences acquired during the visit are beneficial and necessary. In the afternoon the same day, Sonowal met with permanent deputy head of the CPV’s Economic Commission Cao Duc Phat and Deputy Minister of Agriculture and Rural Development Ha Cong Tuan. Both sides discussed agricultural and rural development policies as well as cooperation opportunities between Assam and Vietnamese localities in fields of Assam’s strength and demand such as aquaculture, farm produce processing and export, and mining. While in Vietnam, the delegation held a working session with the Vietnam Academy of Agricultural Sciences and visited agriculture establishments in the northern provinces of Vinh Phuc and Hung Yen.